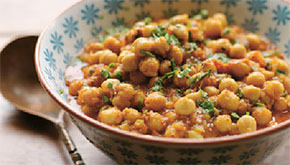 Place the chickpeas in a large pan with 500 millilitres of warm water and boil for about 5 minutes over a high heat. Remove from the heat and set aside, still in their cooking water. Heat 4 teaspoons of oil in a small pan for 30 seconds over a low heat, then stir in the coriander seeds, cinnamon, red chillies, cloves, peppercorns, bay leaves and 1 teaspoon of the cumin seeds. Fry the spices for five minutes or so, until dark brown, stirring continuously so that they don’t burn, then set this garam masala aside to cool. Heat the remaining 75 millilitres of oil in a large pan for a minute over a medium heat, then add the other teaspoon of cumin seeds and fry until they start to brown. This only takes a minute or two, so be careful not to overcook or burn them. Stir the onion paste into the cumin seeds (watch out, as the oil may spit) and fry until dark brown, stirring regularly to avoid sticking or burning – I usually stir, cover the pan, and leave the mixture to cook for a minute before stirring again, repeating this five or six times until the onion is done. Crush the ginger using a pestle and mortar (or a blender), to make a fine pulp. Stir the tomatoes into the onions, followed by the ginger, salt, red chilli powder, turmeric and sugar, then increase the heat to high. Stir in the chickpeas with their cooking water, along with an additional 300 millilitres of warm water, then cover the pan and leave to simmer for five minutes, stirring occasionally. While the chickpeas are cooking, finely grind the cooled roasted spices in a blender or with a pestle and mortar. Add to the chickpea mixture, stir, then remove the pan from the heat. Sprinkle with the chopped coriander, then cover the pan again and leave to rest for around 10 minutes to allow the flavours to infuse. Reheat over a medium heat until piping hot, and serve. Combine cinnamon, salt pepper, sugar, onion, and garlic. Blend in 1 tablespoon soy sauce. If not spreadable, add another tablespoon of soy sauce. Rub mixture into loin. Refrigerate 3 hours to overnight. 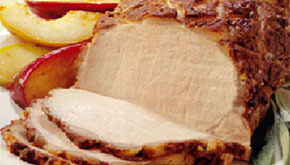 Grill pork over medium-low indirect fire 1 to 1-1/2 hours (about 20 minutes per pound) or until internal temperature on a thermometer reads 145 degrees F. Remove roast from heat; let rest about 10 minutes before cutting into thin slices. The Goan version of pulled pork is a meal for times of celebration. Serve it in lettuce cups with spicy coleslaw. First make the masala marinade. With a pestle and mortar, coarsely crush together the cinnamon (or cassia bark) and cloves. Gently toast this mixture in a dry frying pan over a low heat until a spicy fragrance emanates from the pan. Tear the red chillies into pieces and add to the pan. Continue to dry-fry the mixture for a short while but do not burn. Set aside to cool. Put the cooled spice mixture in a blender. Add all of the remaining masala ingredients and blend the mixture to a relatively fine paste. Taste and adjust seasoning if you like. Rub the masala all over the pork, and place the meat in a dish in which it fits snugly. Set aside any remaining masala. Cover the meat and set aside in the refrigerator, if possible for a few hours. Preheat the oven to 180C/350F/Gas 4. Pour the oil into a roasting tin and heat on the hob over a medium heat. Scrape any excess masala from the marinated pork, place the pork in the roasting tin and brown well on all sides. Transfer to the oven and cook for 30 minutes. Reduce the oven heat to minimum. (You can now pour a few tablespoons of marinade over the pork for extra flavour. Any leftover marinade can be set aside to use for another dish.) Cover the pork tightly with aluminium foil, well tucked in so that the pork steams in the tin and the meat literally falls off when cooked. Cook for a further 3–3½ hours if using a rolled joint, although it may take as long as five hours. If you have the time, the meat will pull apart beautifully after 10 hours of cooking on a low temperature. If using smaller pieces or individual chops, adjust your cooking time accordingly. Remove the pork from the oven and shred using two forks. 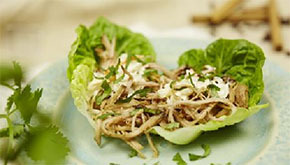 To serve, put some pork on top of a lettuce leaf. Top with some coleslaw and/or some coriander. Combine juice, honey, lemon juice, garlic, seasonings in a large ziptop container. Add chicken pieces, seal bag, shake to coat well and let marinade in the refrigerator for 8 hours or overnight. Heat oven to 350°F and have ready a large roasting pan, 9" x 13". 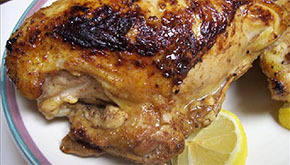 Remove chicken from the marinade, shake off the excess and set chicken aside on a plate. Pour marinade into a small saucepan and bring to a boil, reduce heat to medium and boil until it has reduced to 1 cup and has begun to thicken (about 10-15 minutes). Heat oil in a skillet and brown chicken parts over fairly high heat just a few minutes per side, lowering heat if needed to prevent from charring- you want the chicken to be evenly browned, but not fully cooked yet. Place chicken in the roasting pan and pour the reduced marinade on top. Bake 30-55 minutes, or until chicken is fully cooked and no no longer pink (will vary based on the chicken pieces you use). Skim fat from the pan juices and serve juices as a dipping sauce if you like. In a pestle and mortar, make the garam masala by crushing up and grinding all your dry spices. In a heavy-bottomed casserole or pan, heat the safflower oil and add the onions, sweating on a low heat until soft and translucent. Add the garlic and stir for another half a minute, taking care not to burn it. Add to this mix the garam masala and chilli and coat the onions with it. Add the pumpkin and the chickpeas/garbanzo beans and then pour over the stock, followed by the coconut milk. Season and simmer for 10 to 15 minutes, add the mangetout, and cook for another five. To make the saffron cinnamon rice, put the rice in a sieve and rinse until the water runs clear. Put the rice in a large saucepan with the water, the butter, cardamom, saffron and cinnamon. Bring to a rolling boil, quickly turn the heat down, put a lid on the saucepan and then leave for 10 minutes. Remove the lid and take it to the table in the saucepan, because it looks like a painting. 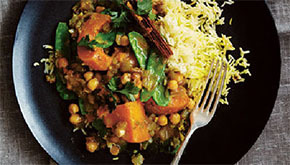 Serve with handfuls of coriander/cilantro. You can add fresh fish in big pieces to this curry. Just put it in once the potatoes are soft and cook it gently until the fish flakes easily. The anchovy gives the curry a wonderful depth. Dried fish is used quite a lot in Sri Lanka as a seasoning. Roughly chop the peeled red onion, finely chop the garlic and ginger. Heat a medium-heavy saucepan, pour in the oil and then add the onions, ginger and some salt. Cook gently for five minutes, then add the spices (except the cinnamon), curry leaves and chilli. 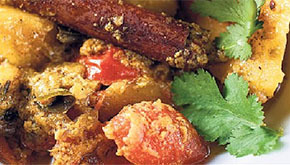  Cook for a couple more minutes, then add the coconut and anchovy fillets. Add the cinnamon stick, flaked up a bit, and the cardamom, lightly crushed. Cook gently for a few more minutes while you peel and chop the potatoes into rough, inch-long chunks. Add the potato to the pan and top up with water if necessary to cover the potatoes. Simmer gently for about 20 minutes until the potatoes are soft, then add the tomatoes and cook for a few more minutes. Taste for salt, and perhaps add a squeeze of lime if your tomatoes were not very acidic. In a small bowl, mix sauce ingredients together. Put the cinnamon sticks and the water in a pot and bring to a boil. Cook about 5 minutes over medium heat. Under cold running water, rinse the rice in a saucepan until the water runs clear. Drain and add the rice to the cinnamon water. Bring the water to a boil again, reduce the heat to low, and cover. Simmer covered for 17 minutes, or until craters appear in the surface of the rice and the water has been absorbed. Heat a wok or large skillet. Add the oil and heat until hot. Add the leeks and garlic, and stir-fry over medium heat until slightly softened and translucent. Add the curry powder and stir-fry for 10 seconds, until fragrant. Add the carrots, turnips, rice wine, and water, and partially cover. Cook about 5 to 8 minutes, until tender; then add the cooked rice, breaking it up with a spatula. Add the peas and the sauce. Toss lightly to coat the ingredients and spoon into a serving dish. Serve hot.